It offers higher education like various programs in Engineering, Technology and allied Sciences which are somehow connected with the current and expected future needs of the society. It was established on 4th September 1978.It not only disseminate knowledge and promotes research but it also fosters cooperation between the academic and industrial communities. It became an affiliating university in 2001, absorbing all engineering colleges in TN. It is a dream of students to get admission in the Anna University. To get enroll in any of the professional courses of the institution, one needs to pass a common entrance test namely Tamil Nadu Professional Courses Entrance Examination (TNPC EE). The examination is popularly known as TANCET (Tamil Nadu CET). The college follows a dual semester system. Every year, the university releases information regarding the TANCET, the candidates interested in taking admission in the institution can appear in the examination. 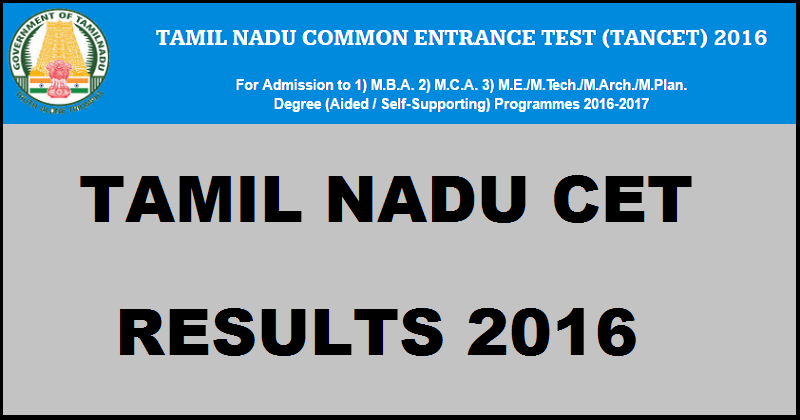 The Anna University, TamilNadu successfully conducted TamilNadu CET 2016 on 11th and 12th June 2016. Candidates in large number who are looking for the admission into M.B.A, M.C.A and M.E/ M.Tech / M.Arch degree programs appeared in the examination. The examination was conducted at various centres in the state Tamil Nadu. All the candidates who had appeared for the examination were eagerly waiting for the results. The students would be in great stress but now their wait for the result is over. The University has declared TANCET MBA/ MCA/ M.E/ M.Tech Results 2016. Candidates can easily check their result on the official web site as mentioned below. • It will display the homepage. • Click on ‘TANCET Results 2016’. • Enter your details such as Email ID and password as asked in the link. • The TANCET Result along with marks sheet will pop up on the screen. Stay tuned for latest education news and all other results updates.